Sam Loveridge with Breathe Magic therapist Emma Cahill. Photo by Gabriel Larmour. Last week I was privileged to witness an innovative health project which is transforming the lives of disabled children. Unlike your average NHS experience however, there’s wasn’t a uniform in sight or a whiff of surgical spirit and the practitioners’ tools included sponge balls, playing cards, seemingly bottomless Mary Poppins’ bags and spinning tops. 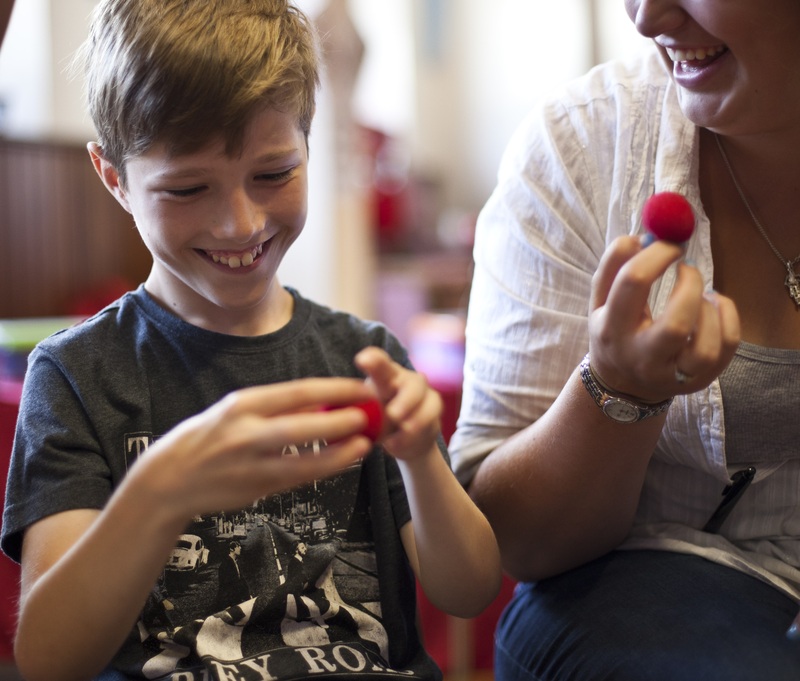 Breathe Magic is the result of an inspiring collaboration between Magic Circle magicians and occupational therapists and comprises an intensive programme of therapy – packaged as a two-week magic camp. The intervention, delivered by Breathe Arts Health Research, has been designed to improve the motor skills of children with hemiplegia (a weakness or loss of control affecting one side of the body). Each magic trick taught has been carefully selected to incorporate a series of precise exercises that help develop essential movements – such as reaching out the arm, rotating the hand, or picking up a small item using the thumb and forefinger. The impact has been astonishing, with many of the children being able to do every-day tasks for themselves for the very first time (and using both hands), such as getting dressed, or cutting up their own food. The testimonials of the children who have taken part in Breathe Magic show that the programme not only increases children’s motor skills and independence, but also their communications skills, self-confidence and self-esteem – which makes a big difference to those who have had problems socialising or worse still, have suffered bullying at school. The strong anecdotal evidence is backed by a formal clinical evaluation which showed that after taking part in the camp participants could do more than 85% or everyday tasks independently, compared with only 25% before the camp. A total of twenty one children participated in two Breathe Magic camps this summer and they will now attend monthly clubs (for six months) to maintain their skills and motivation. Funding from NHS Lambeth Clinical Commissioning Group enabled children from Lambeth and Southwark to take part in the 10-day camp in London and an earlier camp at the Stepping Stones School in Surrey was made possible with support from the COINS Foundation and parental contributions. Data from these camps will inform the ongoing clinical and economic evaluation. 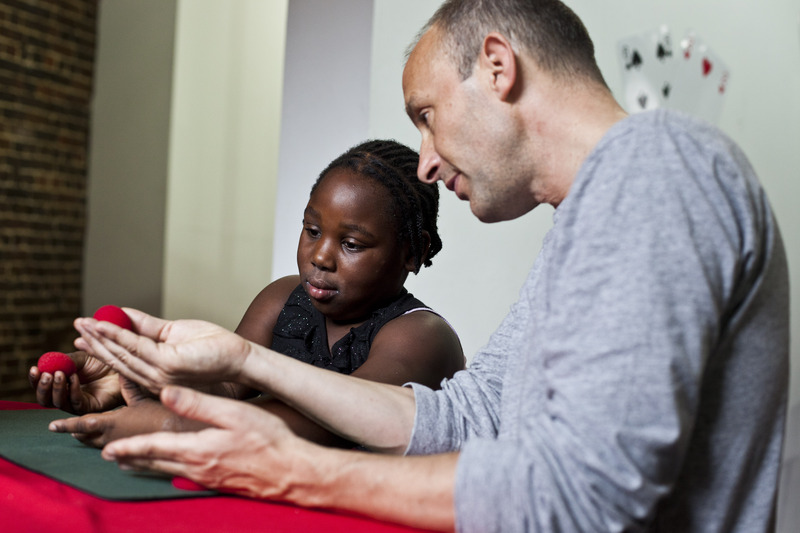 The initiative initially received funding from Guy’s and St Thomas’ Charity to test the effectiveness of embedding magic into therapy for children with hemiplegia. Breathe Arts Health Research is now tailoring the intervention for other patient groups, including a programme for young people with mental health at Great Ormond Street Hospital and a project for people who have had a stroke is in the pipeline. The success of the approach is all down to the fact that the focus is on having fun and learning magic. The participants are so engrossed in learning tricks they are distracted from the frustration of practising repetitive therapeutic exercises. “The children are just so determined. They are supposed to practice their tricks for 20 minutes every evening, but instead, they’re practicing for up to an hour,” said Richard McDougall, one of the Magic Circle magicians involved with the project. “Seeing the satisfaction and pride on their faces when they master a new trick, or perform a task on their ‘wish list’, is such a privilege,” he added. Shanakay with magician Richard McDougall. Photo by Gabriel Larmour. The enthusiasm of the Breathe Magic team is infectious and the energy and excitement of the children at the camp is palpable. The ethos of the programme is about empowerment, so parents are reminded not to help with taking off coats when they arrive in the morning and children are encouraged to cut up their food using both hands at lunch time. Each day brings with it a moment of celebration when a child accomplishes a new task for the first time, be that opening out their fingers from a clenched fist, or doing up their shoe-laces on their own. The final performance of the London camp, in the hallowed surrounding of the Magic Circle, was inevitably an emotional event. The culmination of two weeks’ tireless practice showcased before an audience of proud family and friends. An uplifting speech by patron Bethy Woodward, the award winning Paralympic athlete, about her own experience of learning to embrace her hemiplegia and I am sorely regretting wearing mascara. As well as an impressive array of tricks, the young performers also dazzled the audience with their comic timing and stage presence. By the time each of the children have been awarded their certificates, and are holding them proudly on the stage (with both hands, of course), I am a blubbing wreck. But the magic of the experience promises to continue well after these children go home. 11 year old Sam Loveridge has thrown away his hand splint since attending the Breathe Magic camp in Surrey, his Mum, Jayne, says he’s like a ‘brand new boy’, and his friends have been asked not to help him tie his shoe-laces anymore. One only hopes that this life-changing intervention receives further investment from other NHS Clinical Commissioning Groups to ensure that more children across the country can benefit.